Last week, the weather looked perfect for maple sap. I jumped at the chance to get ready. I kept an eye on the weather and the current conditions. I decided NOT to tap this past week. I think a few guys couldn’t resist the temptation, but I see another cold snap about to descend upon us with sub-zero temperatures…lasting at least ten more days. My woods were deep with snow, over 15 inches. The weather suddenly warmed on the frozen trees. It even rained quite hard. The woods that had been deep snow, became flooded much deeper than my boots. 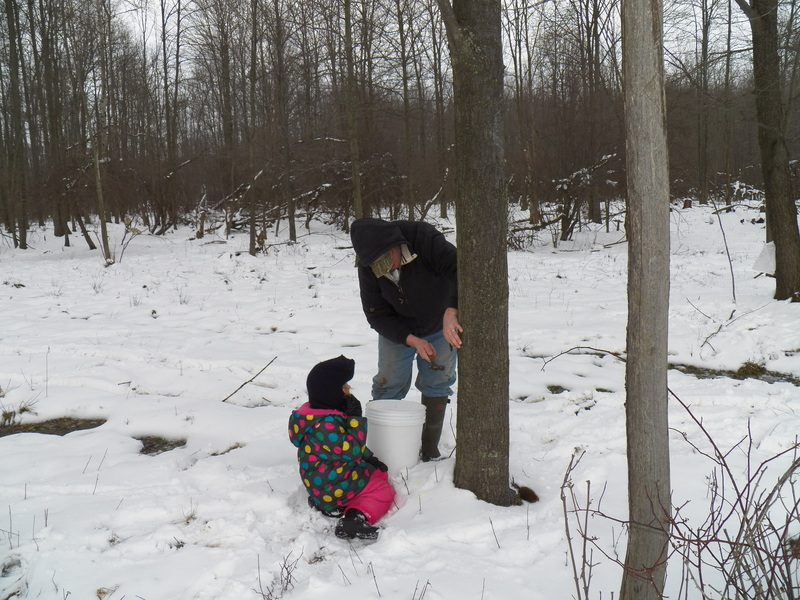 I agonized about tapping, but after talking with some experienced maple producers, I resisted the urge to tap the trees. Once a tree is tapped, the tree starts to try to heal that wound. The sap floods the tap. As the days turn into weeks, the hole begins to dry out. If I would have tapped this week, our holes would have been left to dry almost fourteen days before another weather pattern will arrive that may bring sap again. Waiting will give us fresh holes, eager trees and a little more time to be ready. If I missed any sap during this quick warm up, it was a negligible amount. We tapped too early last year in a haste to get started. We didn’t even make any syrup that first warm up. All we did was sweeten the pans. We had to battle ice in our bags last year as the trees would dribble during the day and freeze at night. Then we would get a nice warm up, but our bags were already half full of ice…the bags couldn’t hold all the fresh sap. We learned a BIG lesson last year. It looks like the deep freeze will return for most of next week. I am glad that I don’t have to worry about my equipment freezing up and breaking or bags filling with ice. The snow has melted to almost nothing now, so walking through the woods to tap will be an easier job too.